In addition to the basic functions expected of an RDS encoder, the Audemat RDS Encoder now offers great new features that will make it a success at least as great as the FMB80. In a desire for innovation and our expertise in the field of RDS, we worked with the RDS forum to develop today an encoder compatible with RDS2. The MPX over AES technic consists to transform the analog MPX/Composite signal to a digital signal sampled at 192kHz with the MPX/Composite signal inside. This new feature will allow our customers to have a full digital broadcast chain from studio to FM transmitter with a perfect signal quality and purity. A wider dynamic range gives the user very low noise and distortion over all MPX bandwidth. After more than 25 years of RDS the RDS forum today offers a new version of the standard, RDS2 which will significantly increase the bandwidth of the RDS channel. By adding 3 additional subcarriers in the RDS standard, broadcasters will have the possibility tomorrow to send small files such as a station logo or the cover of an album. This feature is part of one of several improvements to the standard, such as a new type of PS that allows UTF8 encoding of desired characters. The Audemat RDS Encoder is already compatible with the new IEC 62106-1:2018 to IEC 62106-6:2018 standard which includes RD2 compatibility with the possibility to add a lot of new features. Can be easily connected to your automation software for automatic display of song titles, artist names and much more on receivers (if permitted by your regulation authority). 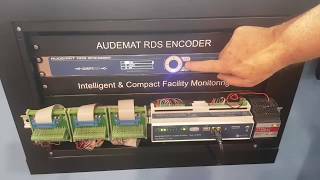 AUDEMAT RDS ENCODER is fully compliant with the RDS/RBDS standards, support all groups and features of the standards and offer TCP/IP connectivity. The AUDEMAT RDS ENCODER may be controlled through a responsive website.